(Newser) – For all the couples out there trying to do everything just right in the weeks leading up to conception, scientists are now suggesting that not just women but men, too, cap their caffeine consumption at two drinks per day. In other words, healthy sperm are very much a part of the equation, and the entire couple's "lifestyle factors" are associated with pregnancy loss, National Institutes of Health and Ohio State University-Columbus, researchers report in the journal Fertility and Sterility. The study followed 344 singleton pregnancies in Texas and Michigan, and observed 98 miscarriages (or 28%); the results produced three factors associated with an increased or lowered risk of miscarriage.
" . . . . while her adherence to vitamins halved it . . ." gluing on vitamins prevents miscarriage? Onto which part of the body? All these stories about the benefit of caffeine are bunk Paid for by the coffee industry. 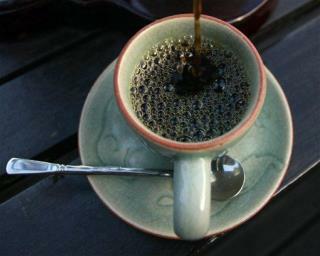 Caffeine is a poison; we take it in small amounts so that we don't notice. It causes digestive tract cancers, among other things. But hey, it makes us work like beavers, so who cares?